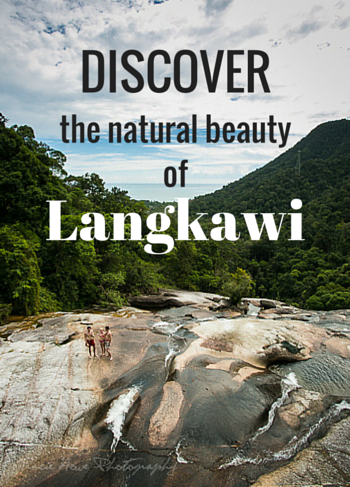 Discover the natural beauty of Langkawi The misadventures of a restless photographer. Travel photographer and travel blogger, Tracie Howe, wanders the globe seeking out new adventures and photo opportunities to blog about. Join her for a unique perspective on travel, travel photography, and travel tips. 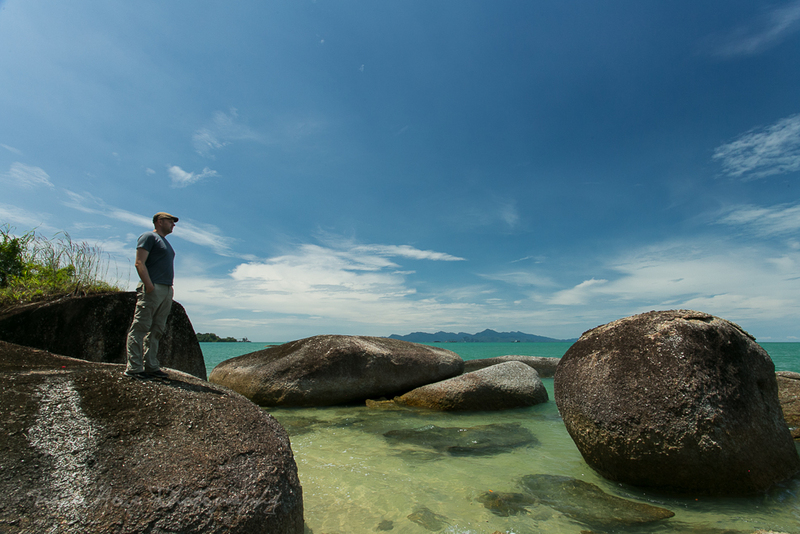 When I decided that Dave and I should visit Langkawi Island in Malaysia, I didn’t really know what to expect. Until recently, it hasn’t really been on the radar for foreign travelers. I only knew about it after getting a recommendation from fellow travel-blogging friends, Natalie and Rob, of Love and Road. Fortunately, they had shared a helpful post on what to do in Langkawi, so we had a place to start once we got to the island. We took a few of those ideas, which were also suggested by others, but we strayed from the typical tourist path just a bit as well. 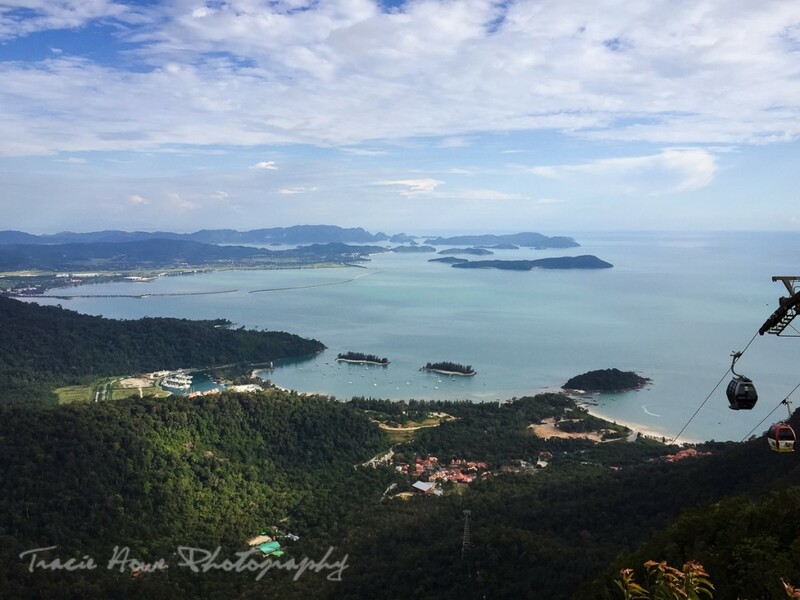 There really is so much to do in Langkawi, but in this post I will focus mostly on the natural beauty that the island has to offer and how we saw what we could of it. 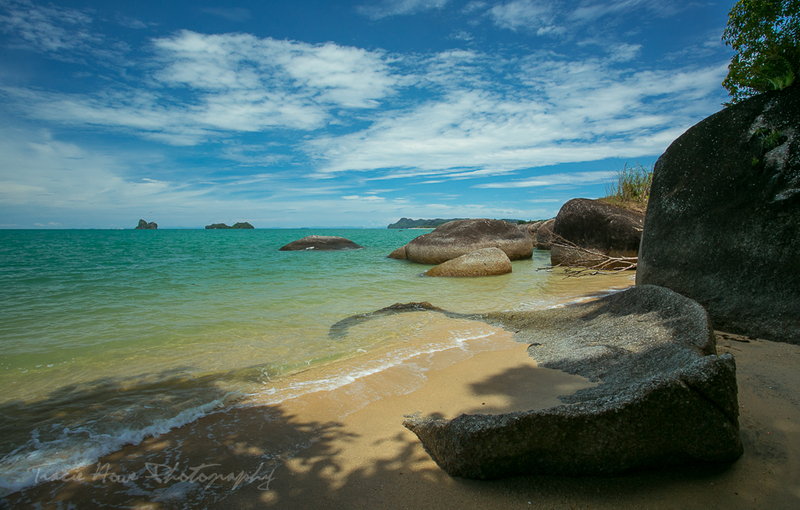 It’s important to know that Langkawi is an archipelego of islands in Malaysia, just beyond the border of Thailand. You must fly or take a ferry to get to the largest island, Langkawi Island. Once you are on Langkawi, your options are to take taxis or rent a scooter or car. We started off by taking taxis which wasn’t too expensive because we stayed close to the town for the most part. Later we rented a car to explore and access areas further away. I can’t be trusted on a scooter! We ended up staying in the Pantai Cenang area in the southwest part of the island. That was nice for being within walking distance to stores, restaurants (especially the mall which we frequented for many emergency supplies), and beaches. We spent most of our nights at the very charming La Pari Pari, which can be found on Airbnb. We discovered it’s restaurant first, Fat Cupid, and fell so much in love with the ambiance of the place that we decided to sleep there too. The staff was very friendly and always helpful, and the grounds were quaint and pretty. We can’t recommend La Pari Pari enough! 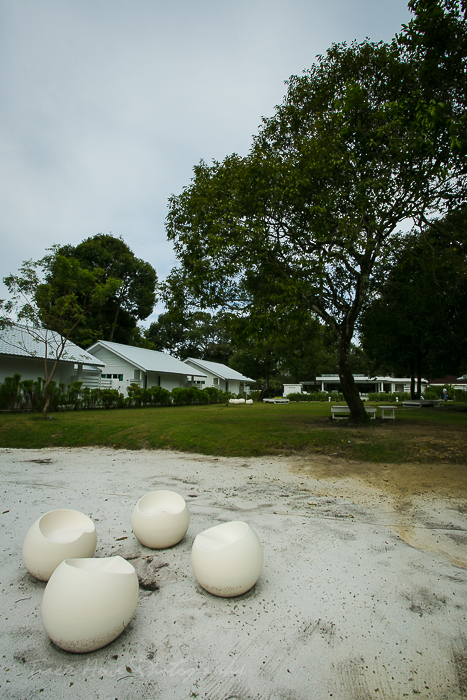 Looking towards the little bungalows at La Pari Pari. 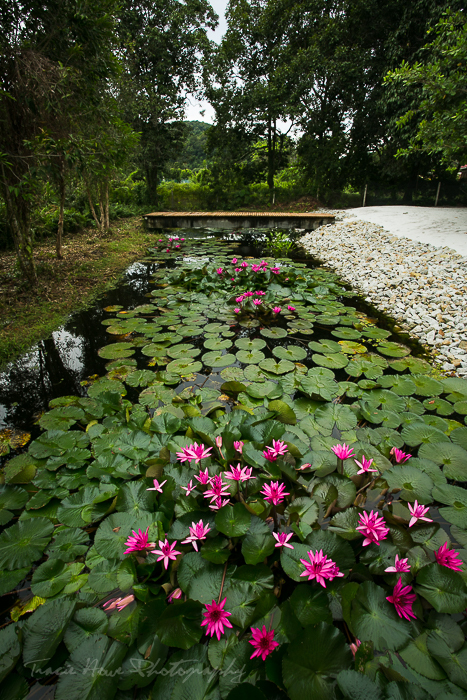 The pretty pond area behind La Pari Pari. 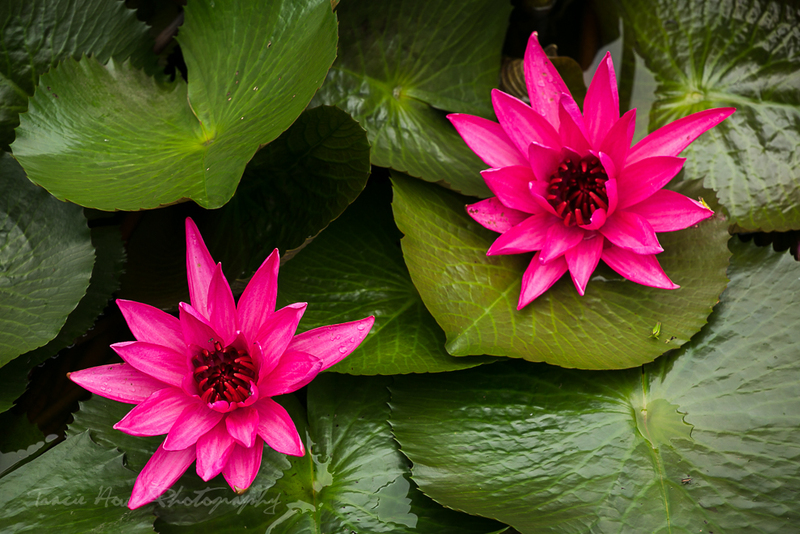 Can you tell that I was in love with these Lotus flowers? 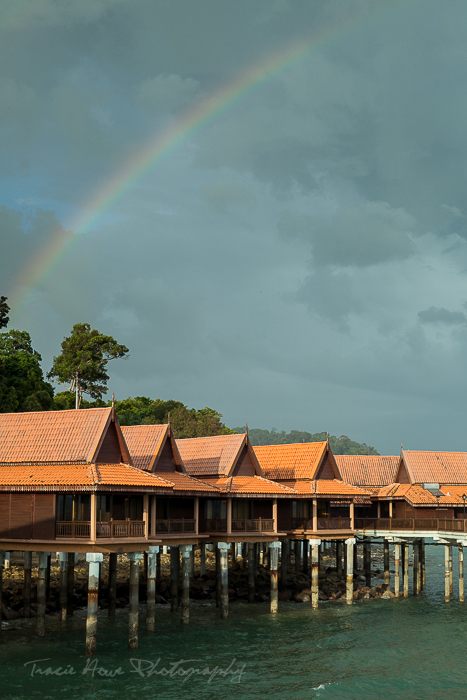 A rainbow over Berjaya Langkawi Resort . In retrospect, as much as I enjoyed La Pari Pari, I would also have liked to stay half the time further north along the west coast due to the proximity of other island attractions. 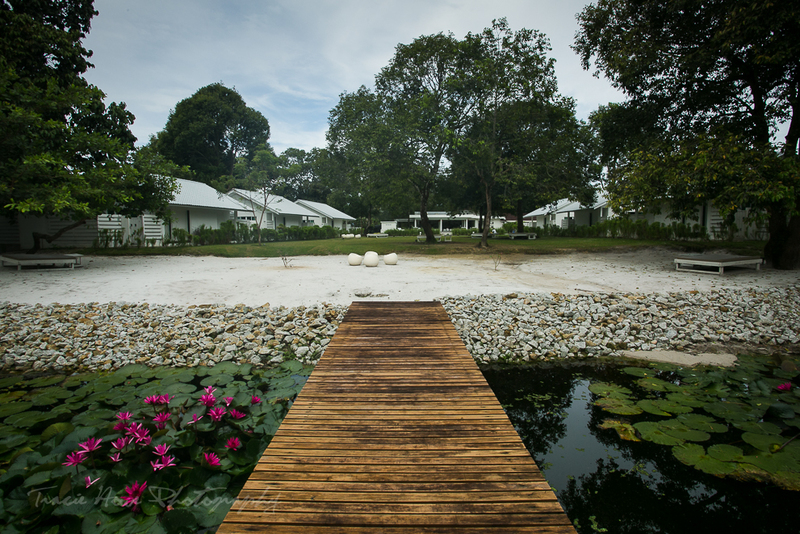 We had the pleasure of visiting this area’s top hotel, Berjaya Langkawi Resort, for our jungle tour because of the abundance of wildlife to be found there. If I had my choice I would stay there for the wildlife and the scenery! We ended up extending our stay in Langkawi from 2 days to 6. Dave had a short time to travel with me so we decided it was better to not keep rushing around from place to place. Langkawi is certainly a very nice place to relax if you have enough time on the island, and even with 6 days I don’t think we had nearly enough time. 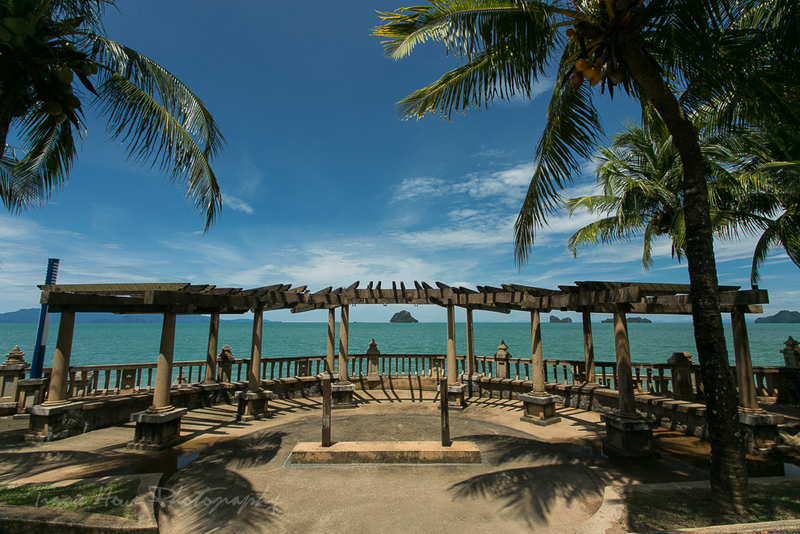 However if you are there to relax, there are two popular beaches at Pantai Cenang – Pantai Cenang beach and Pantai Tengah beach. I’m not a big fan of beaches unless they are untouched and beautiful. These are pretty stretches of beach, but built up for doing beachy things like sun bathing, swimming (although there are apparently a lot of jellyfish), renting jet skis, or having a meal or a drink. I know there are many more beaches to see on the island, but I’m afraid we only had time to see a few. We found Taman Awam Teluk Yu while exploring with our rental car. It’s a a lovely park with a few small slivers of beach and it seemed to be popular with the locals. A little farther along this road to the north we came across another park which didn’t appear to have a sign with a name. 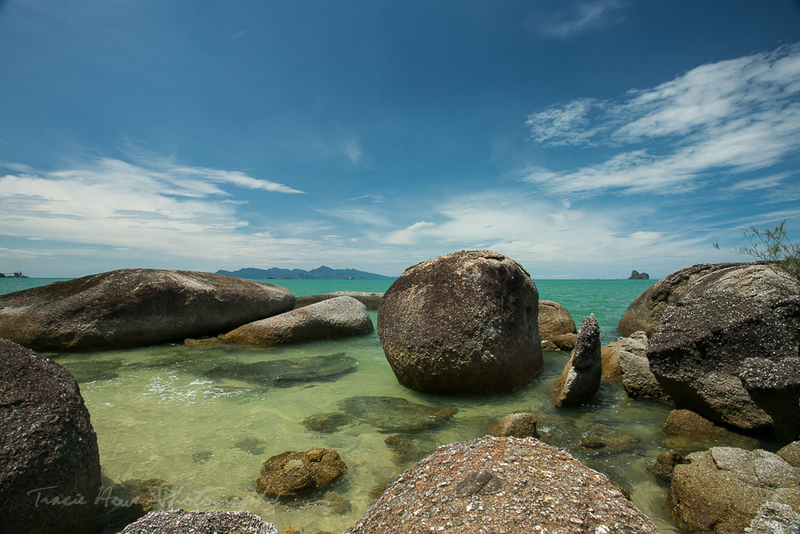 Once we parked in the big empty lot, we climbed down a small hill to a beautiful beach strewn with giant boulders. This was by far my favorite beach. I only wish I knew the name! The pretty Taman Awam Teluk Yu found while driving around. 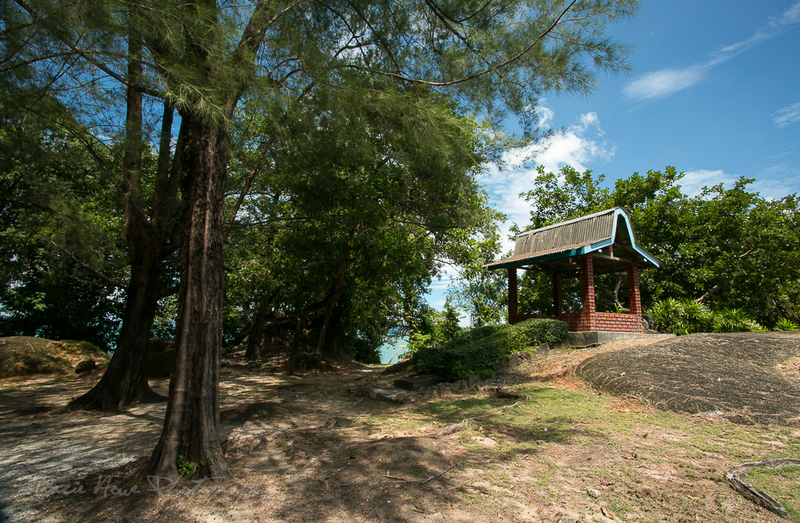 The upper park area of our hidden beach. Dave looking out from the top of a boulder at the hidden beach. 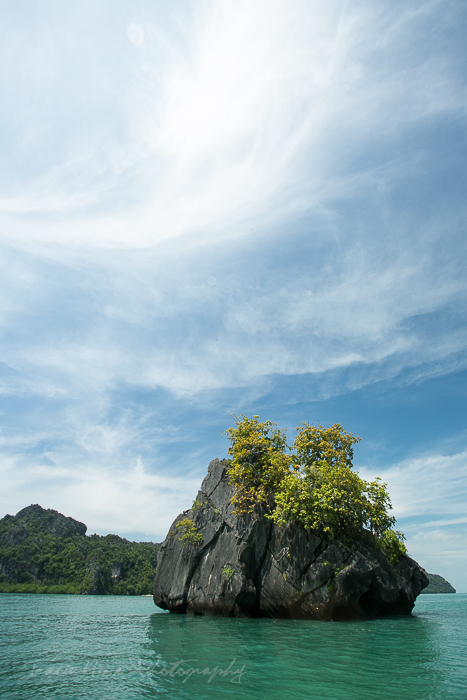 Langkawi is a natural wonderland. A few years ago it was given the UNESCO Global Geopark status which it will maintain as long as conservation efforts remain a priority. 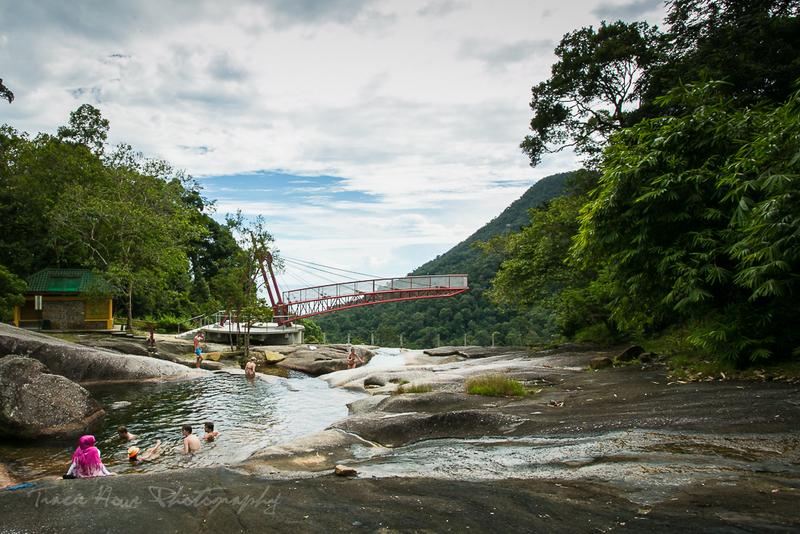 Unsustainable tourism development is putting Langkawi at risk for losing it’s status, so it’s important to practice responsible tourism when visiting Langkawi (and everywhere else of course!). Early in our visit we were fortunate to find out about an eco-friendly tour company, Dev’s Adventure Tours. Dev’s has several types of tours, but we knew that visiting the Mangroves was one of the must-dos for Langkawi so we booked a boat tour. The tour starts at Kilim Geopark Mangrove with a walk through the bat caves, continuing with boating and spotting wildlife through the Mangrove. After that the boat speeds up through the Andaman Sea for some island sightseeing. Then back to the Mangrove for more wildlife and a lunch at a floating restaurant. 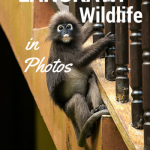 The highlight of this tour for me was the wildlife, which I cover more in a later post along with more on a jungle trek with Dev’s Adventure Tours. Captured from our boat during the Andaman Sea part of our Mangrove Tour. Okay, just one wildlife shot from our Mangrove tour. Look forward to the rest in a later post! First of all, there is a main parking lot which costs 2 MR for entry. This has a few little shops and you will probably see some Macaques hanging around. From here you start walking up the steps. Keep walking. Keeping walking some more. At a certain point, precisely 271 steps from where you started, there is what looks like another small parking lot. I don’t believe you are allowed to drive up there or park, but you might give it a shot if it will save you the stair climb up to that point. From there you have the option of taking a detour to see another waterfall, but we kept on going up. 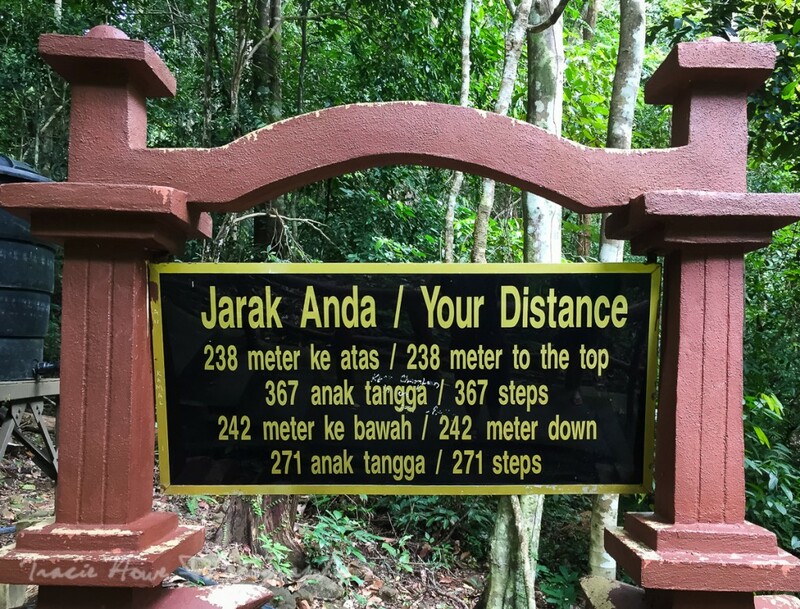 Continue another 367 steps to the top of the Seven Wells waterfall and stop there. Do not bypass this area in an effort to save energy because you think you still have a climb to the top of the waterfall. Do not proceed into the jungle along the well marked path just beyond the waterfall. Do not crawl under logs lined with nasty termites that will fall on you. Do not trust the one guy you see on the trail who says the end is very close, unless you intended to go to the top of the mountain. The top of the waterfall is the area where the steps end and no further. Once we realized our stupid mistake, we trudged back down hungry and sweaty. The big reward at the end was a dip in on of the waterfall’s 7 chilly pools, which I finally took a moment to admire and photograph. I was anxious to have a quick dip, but the water was cold enough that I knew I’d have to jump in quickly rather than ease myself in slowly. As I searched for a deeper pool to jump into, I stepped on a slippery spot and slammed into the rock. I thought I had broken my hand because my fingers were stuck in a curled up position, but fortunately I only got a giant bruise on my palm, among other places on my arm and thigh. I almost passed out until the pain eased. At that point my little dip was such a welcome relief from all the trials leading up to it. So if you do visit this waterfall, please heed my warnings of false tops and slippery rocks! 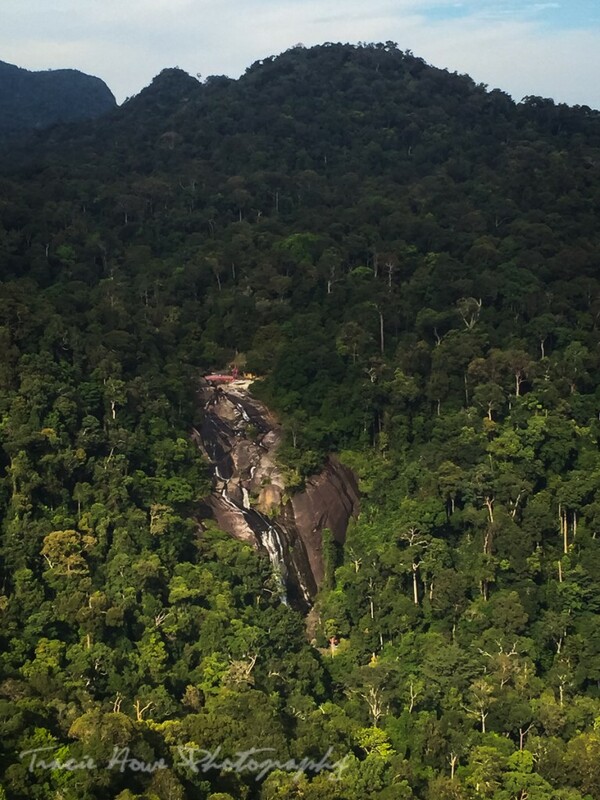 Taken from the half-bridge viewpoint at the Seven Wells Waterfall in Langkawi. A few more pools, the area where I had my fall (off to the right), and the weird half bridge that hangs over one of the drop offs. Looking back towards the jungle from the half bridge. 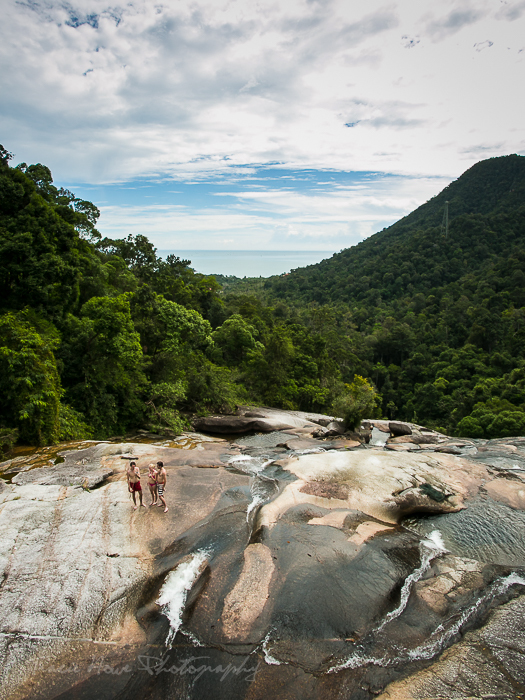 There are some nice views to be found all over Langkawi from the beaches to the waterfalls, but there is one that trumps them all. 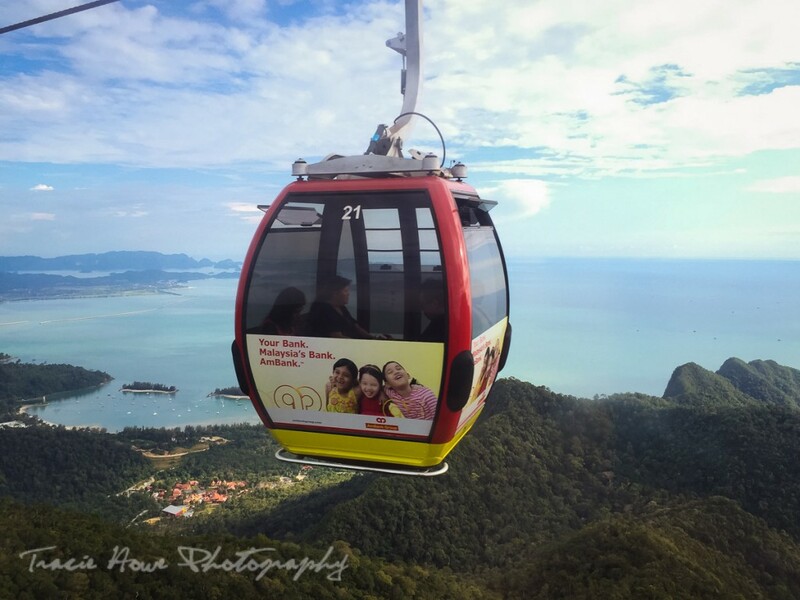 Panorama Langkawi is a mini theme park centered around one of the steepest cable cars in the world. SkyCab is the cable car that goes to the top of Machincang Mountain, the oldest land to rise from the ocean in Southeast Asia. At first I was hesitant to ride to the top because often what non-photographers consider to be a nice view (no offense!) is not that great for amazing photos. However, I figured since it was such a big attraction that I should just see for myself what the big deal was. The ride up is pretty terrifying if you are afraid of heights or have a very active imagination. I tried to focus on the beautiful view as we ascended up the jungle covered mountain. As I became more and more excited about this impressive view I realized I had forgotten my camera in the car! We had only intended to eat food at Panorama Langkawi after our waterfall misadventure, but when our plans changed I didn’t remember my camera. I blame fatigue! At least I had my phone. Anyway, if you have the courage to get into a 6 person gondola that takes you 1.4 miles (2.2km) up, then you will be rewarded with stunning views all the way up. We even saw our infamous waterfall in the distance. Once you get to the first stopping point, the Middle Station, you can get out and explore a bit. You may also continue to the Top Station if you prefer not to get out here. 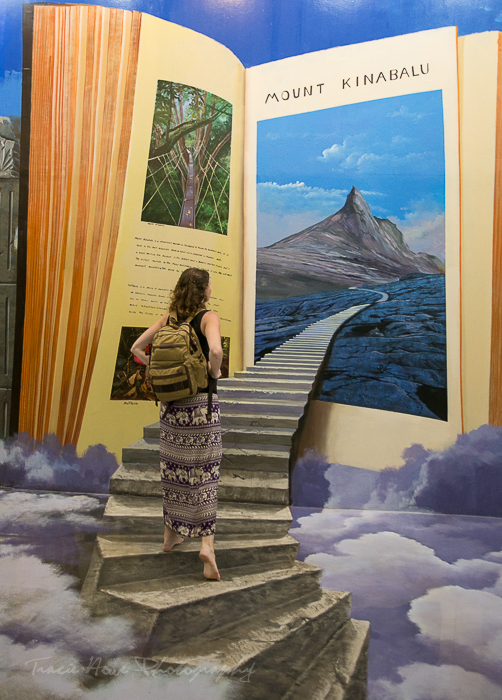 The Top Station is where you can explore some more or go to the SkyBridge, a pedestrian walkway suspended high above the jungle. We didn’t pay the extra fee to go there, but we could see it from the viewing platforms that provide a 360 degree view of the mountainous island and the sea beyond it. It really was impressive that such structures as the cable car and Skybridge were built so high up in the mountain jungle. One of the views from the mountain taken with my phone. View of the Skybridge from the cable car viewpoint. As a side note, if your fear of heights outweighs your desire to see spectacular views, then I recommend hanging out in Oriental Village, the area at the base of SkyCable. There are plenty of things to do here, from rolling around in a water orb to a virtual experience at SkyDome. Besides eating, the only other thing we ended up doing here was visiting the 3D art museum, which I highly recommend! Make sure you bring either a friend or a tripod, because this place offers fun interactive photo opportunities! 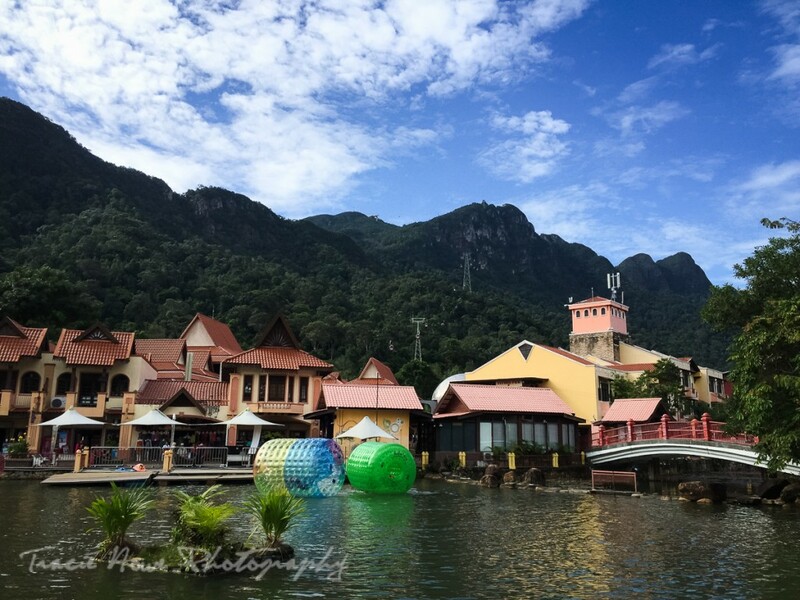 Langkawi’s mini theme park. Also taken with my phone. Phone’s are handy cameras, I’ll admit that! The 3D Art Museum was so fun! I got Dave to take some photos of me. Just one more… I have quite a few actually. ;) Thanks Dave! I can’t possibly explain all there is to see and do in Langkawi after such a short visit, but I do know that I’d love to go back and explore some more. 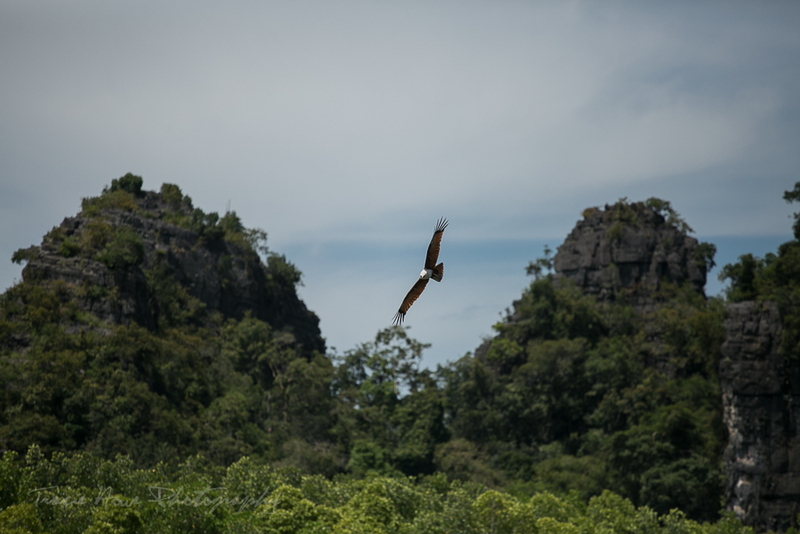 For more on Langkawi you can look forward to another post which will highlight all of the wildlife that we saw during our visit. Put your camera in your bag when climbing around slippery rocks! The only thing that saved my camera was a backpack padded specifically to keep cameras and lenses safe. Very important! Emphasize those gorgeous blue skies (no longer affected by the Indonesian haze, I might add) and teal waters with a polarizing filter. DO NOT GO PAST THE WATERFALL! But seriously, if you want to trek to the top of some peak, be my guest. Just bring plenty of water as you will sweat your way all the way up. 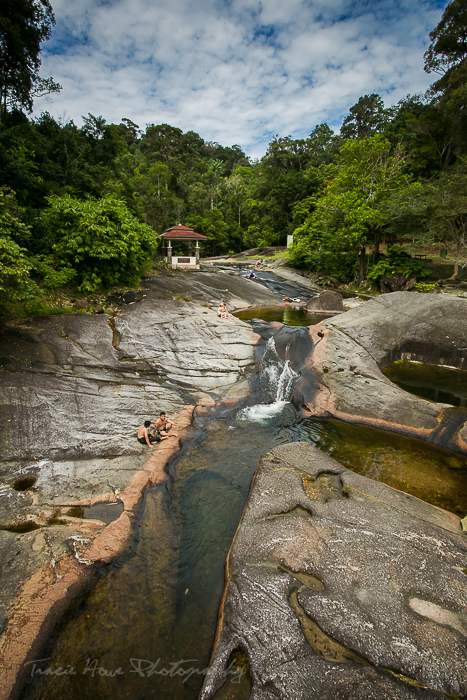 And if you do just visit the waterfall, I suggest taking off your shoes when walking around the smoother rocks. Spend the whole day at Panorama Langkawi. It’s perfect for a family with kids, but also very fun for adults. There is plenty to do besides the cable car. Chris - Looks a beautiful place! Natalie Deduck - Great photos Tracie!! So happy that you enjoyed it! I remember we talking about this trip and how I was trying to persuade you to visit Langkawi! Valerie - This place looks incredible. 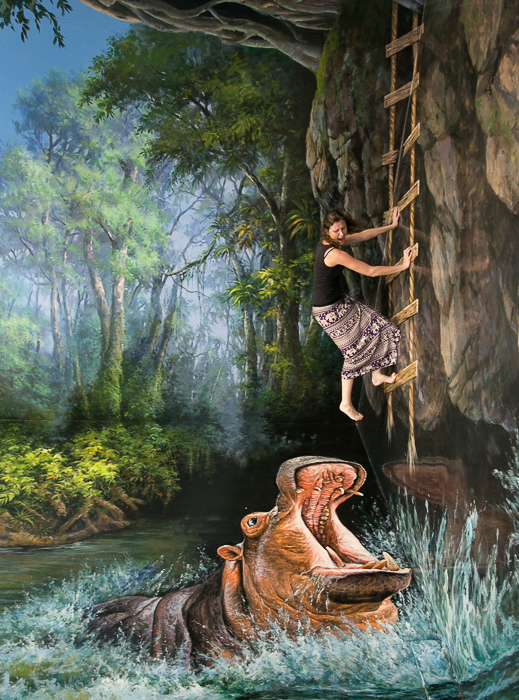 Your story of slipping reminds me of when I jumped off a waterfall in Jamaica and cut my toe on the landing. I wasn’t seriously injured, and the scar makes me smile every time I see it!